File Control helps Solid Edge users to easily and quickly search, manage, and control their design data even if their file management is a total disaster right now. 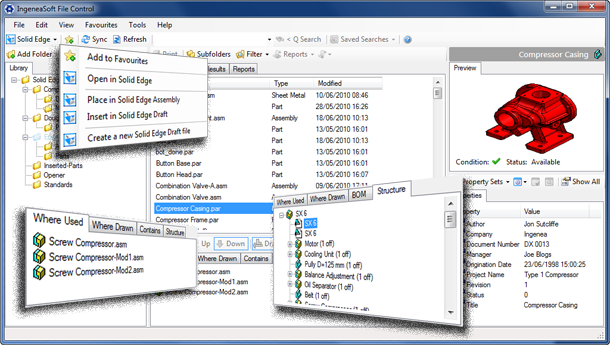 File Control is an easy to use, quick, and efficient data management application for Solid Edge. It has been designed to be simple to install and requires virtually zero configuration. It was developed based on feedback from Solid Edge users worldwide and eliminates the usual bottlenecks associated with trying to find and manage Solid Edge data. Check out the user reviews here and to find out more and buy visit File Control. 6 years of struggling with uncontrolled Solid Edge data has come to an end with File Control. Now, I am able to confidently navigate my projects and eliminate all those problematic duplicates across the multiple servers of our over complicated system. Just the search and Where used functions make it a must have for every SE user. Great job IngeneaSoft! Very easy to install, works exactly as I thought it would, I was up and running within minutes. Being able to load individual project folders is a good feature. Searches are virtually instant. Worth the money just for the instant where used feature. Another impressive Solid Edge application from Ingenea which everyone should own. File Control has simplified many tasks that previously were time consuming. This has enabled me to spend more time on design & less time on the small jobs. Absolutely brilliant. Full marks to this tool. Every once in a while a software application appears which makes you wonder how you ever managed without it. File control is such a utility. It acts both as a file and a documentation control front end to Solid Edge and makes life so much easier. I would recommend it to every Solid Edge user without hesitation. Just lately I have been using it more and more, what a brilliant piece of software. The Instant search helps me find what I want to work on straight away. The instant where used reports really help when I am trying to find what designs will be affected by any changes I make. Tell us what you think by submitting your own review below but remember to complete the table on the right by clicking on your star rating for each category.